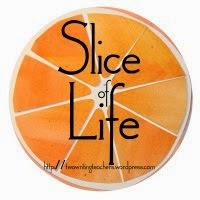 I'm slicing with the Two Writing Teachers community for Day Eight of Thirty-One of the Slice of Life Challenge in March. Thank you Stacey, Tara, Anna, Betsy, Dana, Kathleen, Beth, and Deb. I'd like to share a tradition I started in class a long time ago, from a colleague's idea. All through the year I took pictures of students, working, with friends, playing, on trips, and one individual specific one showing some special part of who they were. For instance, I might take one of a girl in full make-up, a rising star on stage; or I might take an action shot of a boy who studied the physics of skateboards, and he demonstrated on his board! Another might be someone peaking from beneath a table, a place he liked to read and write. And one more example could be a girl at our podium, making a fiery speech (future debater). Why am I describing these scenes? Because through the year I took parts of the photos and made them magnets for a common area file cabinet. These mostly stayed unless one student who was leaving begged me for it. And each time alumni came to visit, they sat by the file cabinet, looking, remembering. However, at the end of the year, those "special" moments I tried to capture as described above were also made into magnets, and were part of the gifts I gave with a thank you note to the student. How-To: Go to an office supply store and purchase a pack of business card magnets, follow the directions, hold the picture up to the light to see what part you'd like, affix the magnet and cut. Voila! You have your picture! Here's my own "refrigerator" magnet collection. FYI-the black & white picture is larger, ordered from a Christmas picture. You can't see it all. I look every day at someone, greeting, saying to myself, "I remember when. . ."
What a great (and easy) idea. Thank you so much. You're welcome, Julieanne. Hope you have some fun with it. Photos are so wonderful! What precious gifts! What a great quote, Loralee. Thank you. I will keep it! Linda, I agree with Julieanne. This is a great idea. I also think the quote Loralee found is one that captures the essence of what you accomplished with your magnet photos. Have a great day. Thanks Carol, I just copied Loralee's quote to be sure I wouldn't forget it. It is just wonderful how much we learn from each other. Hope you have a wonderful day, too. Oh I love this idea!!! Don't think I could manage it with 75 students, but I'm wondering how I could tweak it. Thank you for sharing!!!! You are so inspiring! I bet you can work it out somehow, Michelle. Thank you. Love this idea! I do this with family photos...and my stash of supplies is greatly embellished by freebie magnets from realtors and others that I get in the mail. I never thought about using this idea at school - fabulous! Happy you already do it, Maureen, and hope you find a way at school, too. Thanks. Ooh, that's brilliant, to repurpose the ugly commercial ones! I love the idea of taking pictures to capture the memories for the students! I also like your "be" magnets! Happy you like the idea, Chris. 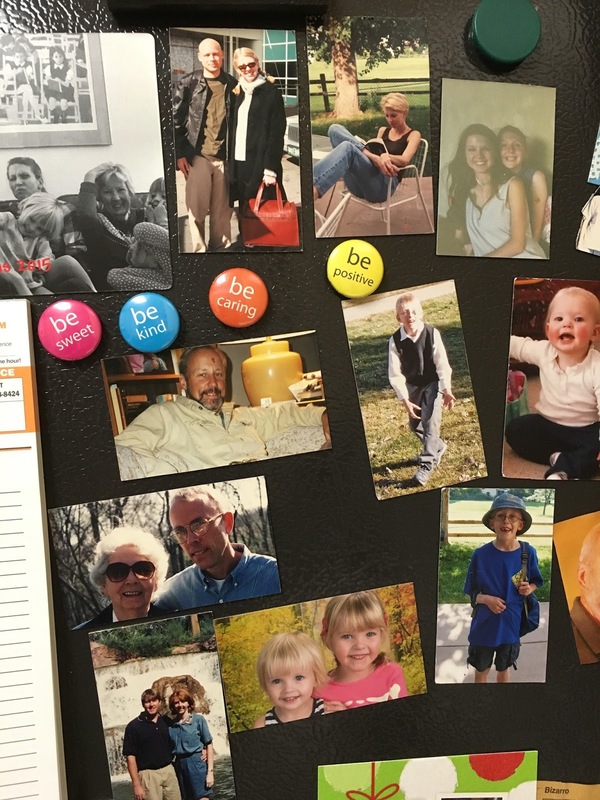 The "Be" magnets are a gift from a student, & were at school first. I love them too. I love this idea too- wonder how easy it will be to find magnets like that here. I also love your "be" magnets and appreciate that you reminded us we are 1/4 through the challenge! Thank you, hope you'll be able to find them. I don't know where you are, maybe online? I love this. I keep looking of a way to honor my little people in my classroom. I'm tucking this tradition away for later. Thank you. Terrific, Kendra. Happy that you will find a way for your class. Such a lovely idea, Linda. I take tons of pictures throughout the year and laminate them for our walls - many kids take these home as momentos, and the rest gets up on our memory wall. I love looking at these - they remind me why I love my job! And that's a great idea too, Tara. Many of the pictures went into our class scrapbook, too. But having something visible all the time is such fun. So simple, but so memorable. Great idea! I need to make one for my mom with Clara's picture. That's a great idea, Elsie. Glad you knew where to use it! So many stories kept alive with a simple photo and magnet. I love this idea, Linda! What a great idea - slices of life all over your classroom! I love how you have them up for many years so students can see a community of learners and writers beyond themselves. Wonderful source for writing territories. Thank you for sharing. I haven't thought of them as slices of life, but you're right, Clare, they are/were! Thanks for the thoughts! What a fantastic way to help you and your students remember all that happened during the time they spent in your class. A great way to keep reminders of family memories. Thanks for sharing. Thanks Judy, it is fun for me to see these pictures, too. So so clever Linda! I can just picture the students coming back searching for his/her magnet! Thanks, Lynn. They did enjoy looking! I come to your blog and it feels like you have a bottomless treasure box of ideas to share. Thank you for being kind and sharing. You're welcome, Terje. I'm trying to share sometimes of those ideas that seemed to stay, to help with community and connections. This is so awesome. I'm going to have to find a way to start doing this. Thanks for sharing! Great idea. I have pictures on a bulletin board, but I love the magnet idea. Thanks! A nice idea and so easy! I love the pictures! Thanks! I'm so glad you shared this! Thank you! What fun! I just put sticky magnet circles on the backs of printed photos and put them up in my classroom, but same idea! Yours are cuter though! Kids love pictures of themselves and their friends, and it makes the room seem so homey! I always took pictures of my students on the first day of school and then gave them to them at the end of the year as a reminder of how much they'd grown throughout the year. I wish I'd thought of making them into magnets. So clever! Thanks everyone, I hope this is something you can make work in your own classes. The best thing is that each one of you seem to already be doing something similar. How wonderful to hear that. I love the idea of posting the pics in the classroom throughout the year. I always took a ton of pics and sometimes did a slide show for the last day, but your idea is the best. Sending a link to this post to my teacher niece. I love having photos on display. Such great memories and so much positivity!